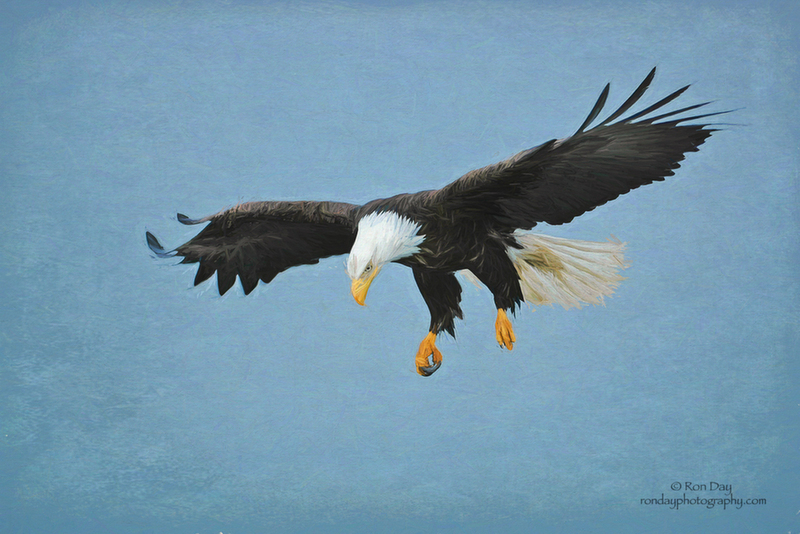 This is the painted version of the Bald Eagle I posted in the Bird's Gallery last year. Please click on image to view full size. Thanks. Nikon DX, Nikkor 200-400mm, f/4 @ 1/500, fill flash. I forgot to mention that it was painted with Topaz Impression II. This is a gem, Ron. Love the texture-looks a bit like origami paper to me-in fact the whole painting is rather oriental in nature. Beautiful contrasts against the blue sky and strong darks. Also a striking pose- Really fine work! A great effort Ron. The bird almost looks to be hovering in the air. brilliant image Ron. the treatment is sublime. Fine work! Beautiful work once again Ron. Thanks everyone. I'm pleased you like it. An impressive original, really showcasing the power and majesty of these amazing birds, beautifully enhanced with your artistic flair, Ron. Ron, fantastic pose, love sense of floating down with those big talons hanging. The texture of the BG is like elegant, fine paper, and the knife-like textures on the the feathers add a lot of drama - super presentation!